Low back pain often results from various forms of sacroiliac dysfunction. Of the ten or so ways the sacrum can become stuck “crooked” between the two innominate bones; the most common is labeled a unilateral flexed sacrum. 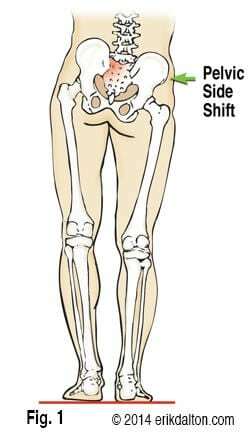 My mentor, the late, great Philip Greenman, DO, referred to this SI joint disorder as “Mall Back” because it commonly occurs during prolonged standing with weight bearing on one leg (Fig. 1). Right motor dominant people often present with ipsilateral psoas hypertonicity, which causes the right ilium to drop anteriorly and inferiorly and the pelvic bowl to left rotate and sideshift over the vestibularly dominant left leg. In an attempt to balance the crooked pelvis, the brain often recruits the left QL to flatten the lumbar lordosis. As the body side-shifts over the left “hip-hiked” ilium, the sacrum is forced to sidebend left and rotate right (across an oblique axis) as seen in Fig. 2. Pain arises when the deep left sacral base gets stuck in this flexed position. To make matters worse, L5 often tries to compensate by flexing, rotating and sidebending left. This position hyperexcites joint mechanoreceptors as the left L5-S1 facets are crammed together. 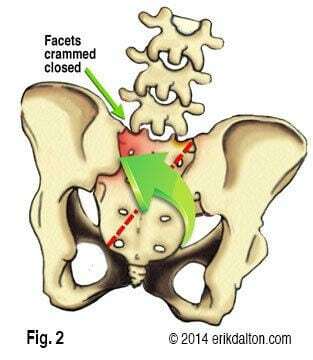 Those suffering this onerous functional pathology, typically experience generalized upper hip and low back pain. Oddly, 95 percent of all unilateral flexed sacrums occur on the left possibly due to motor dominance. Unlike sciatic-like sacroiliac dysfunctions such as backward sacral torsions, the longer the client stands, the more localized the low back pain becomes. This is thought to be caused from sinuvertebral nerve irritation due to iliolumbar ligament and joint capsule strain. Since the annular fibers of the L5-S1 intervertebral disc also receive nerve supply from the sinuvertebral nerve, sustained pelvic torsioning can trigger pain/spasm/pain cycles that are sometimes difficult to break. With the client lying on her right side (knees and hips flexed), therapist grasps client’s left wrist with his right hand. Therapist’s left thenar eminence contacts client’s inferior left sacral border just superior to the coccyx. A slow, sustained counter-force develops as therapist gently pulls on client’s left arm while his left palm braces at the sacrum. The client is asked to inhale and hold to a count of five while gently shrugging her left shoulder against the therapist’s isometric resistance. 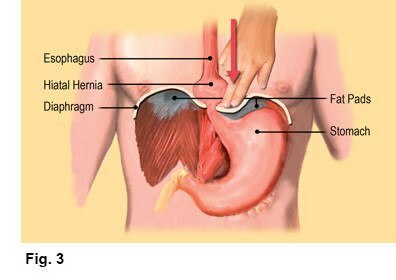 As the client exhales, the therapist takes up the slack by lightly pulling on the client’s arm while maintaining a constant “scooping” pressure on the inferior sacral angle. Anterior/superior ILA palm pressure causes the left sacral base to begin moving posteriorly into its proper position. As the therapist’s right arm left rotates the client’s trunk, L5 helps push the left sacral base posteriorly. Repeat procedure three to five times and re-check for restoration of sacral base and ILA symmetry. Once proper function is restored to the left SI joint, the lumbosacral junction regains normal reciprocal movement during the walking cycle. Therapists should remember that most sacroiliac dysfunctions are associated with length/tension imbalances in the psoas, piriformis, QL, biceps femoris and gluteal muscles. Two major culprits contributing to sciatic-type radicular pain in the presence of a clean MRI are the piriformis and biceps femoris muscles. Unilateral sustained hypercontraction in the biceps femoris is particularly troublesome. Since this lateral hamstring often takes its origin at the sacrum instead of the ischial tuberosity, fascial contractures and sustained myospasm can cause a constant drag on the sacrum and dural membrane destabilizing the entire pelvic girdle. Therefore, the first step in relieving all sacroiliac dysfunctions is restoration of balance to all muscle groups attaching to the pelvis from below and above. Once proper myofascial balance and muscle firing order is established in all soft tissues attaching to the pelvis, any remaining bony asymmetry can be assessed and corrected.